Lazy desert drifters looking down the mouth of an open road with no real destination in sight—this is how it feels to listen to Alex Calder’s newest LP, Bend. Bend floats effortlessly above the dreamiest of dreamers, lulling them softly to continue on the whimsical path to nowhere. 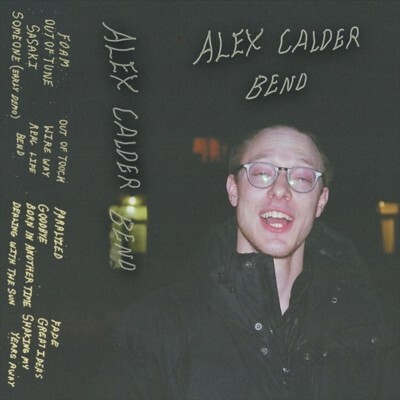 Calder, the Canadian musical magician, recorded Bend in the confines of his living room. He is not only the creative genius behind all of his songs but also the mixer and the recorder of his albums—all without the finest, most grandiose equipment one can buy. The result is not a perfectly mastered record but an utterly drowsy one that maintains the rawness sometimes sucked up and regurgitated inorganically by a studio. The first track on Bend, “Foam,” trudges through the swamps of Calder’s mind. It moves, slow and steady, in contrast to the second song on the LP, “Out Of Tune,” which awakens and rejuvenates listeners through its dreamy pop splendor. The twangy “Someone” is filled with folk guitar parts that are a near contradiction to Calder’s lackluster lyrics. He sings, “I know I’m lazy / I’m laying around while the world’s spinning around.” His words reflect the overall tone of the album. Each song, in its own right, is lazy and sleepy, which often emulates how many millennials exist in our digital age. “Real Life” begins with the boldest drumbeat on Bend. It ferociously sets the mood for the song. Noisy guitar riffs complement the drums to make way for each instrument’s dynamic part. “Real Life” is purely instrumental. The lack of lyrics makes for a perfect bridge between each half of the album. The connection flows seamlessly and maintains the listener’s steady interest. The expanding and contracting that “Born In Another Time” embodies between the keys and the guitar are as edgy as much as they are anxious. The song speaks of the normalcies of everyday life. Calder remembers a time since past as he sings, “I used to watch so much TV back when things were so easy / What I did back then, when I was 14 / I’d pretend that I was born in another time.” He goes on to muse, “My parents were always stressed out / But they never scream and shout.” The lyrics speak to the life of many kids growing up middle class. There is nothing exciting about it, but not everything in music is meant purely to be riveting. Calder reminds us that there is something invaluable about reaching the masses through a message that is so often overlooked yet so relatable. “Shaking My Years Away” only perpetuates the message as Calder mumbles, “Time is forgetting me, taking my dreams away.” How true and cruel that sentence can be.